Are you looking to add ambiance to your living room? There is nothing more comforting or romantic than a roaring fire, but not every home is designed for a real fireplace. Luckily, you can still enjoy the picturesque benefits of a warm, relaxing glow. Our experts performed extensive research to bring you a top ten list of the best fireplace inserts on the market. Check out the specifications below. Type: Whether you’re looking for a gas, electric, or traditional wood-burning fireplace insert, we have something for you. We research wood, electric, gas, and propane fireplace insert reviews and their specifications to make sure we bring you the best. Check here for the details. Remote Control: When you’re cuddled up after a long day, it’s convenient to have a remote control that lets you turn your fireplace on at the touch of a button. If you want the advantage of being able to ignite your fire from the comfort of your couch, check this spec. 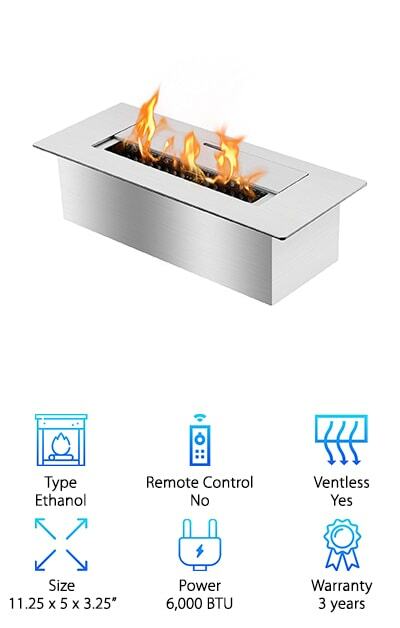 Ventless: If your idea of the best gas fireplace insert or the best propane fireplace insert involves clean burning and use of all of the heat given off by the fire, then you’ll want to be sure it’s ventless. We’ll tell you if the design you’re eyeing is vent-free. Size: You want to end up with the perfect insert for your space, so make sure to take and record the right dimensions for your home and compare them with the details listed on this spec. We’ll have the length, width, and height for each model listed here. Power: Check this spec to determine how many volts are required to operate each model and the corresponding BTUs of heat given off. Gas and electric will both require power. It’s helpful to know how much it will take and how hot it will get. Warranty: If you feel better about your investments when you’re covered under a warranty, then check this spec to determine if the design you’re interested in comes complete with a guarantee. We’ll tell you how many years the manufacturer or seller is willing to cover the insert. Now that you know what to look for, you’re probably wondering: what is the best fireplace insert? All ten of the options on this list are competitors for the best fireplace insert, but each is unique and offers its own exceptional benefits. You’ll find contenders for the best electric fireplace insert, the best wood burning fireplace insert, and their gas and ethanol counterparts. If you’re in a hurry, check out our top and budget picks first. Happy shopping! Easy to install, our top pick is an electric fireplace insert that makes setting the mood effortless. The Puraflame Western features a beautiful brick wall design, life-like resin logs, and an authentic glow. Control the flame brightness via three settings that let you achieve the desired look, and bask in nine different temperatures. 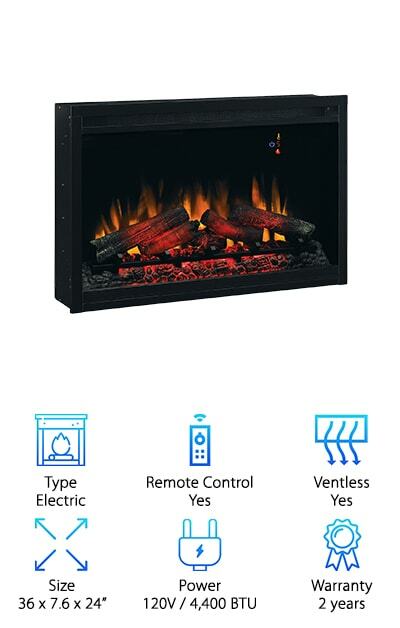 Both can be controlled from the comfort of your favorite spot, thanks to the convenient remote control, or manually controlled by buttons and a dial that are hidden behind a vent on the front of the fireplace. An internal overheating device automatically turns off if an overheat situation is detected, so you can rest easy, knowing your safety was prioritized during the manufacturing of this model. 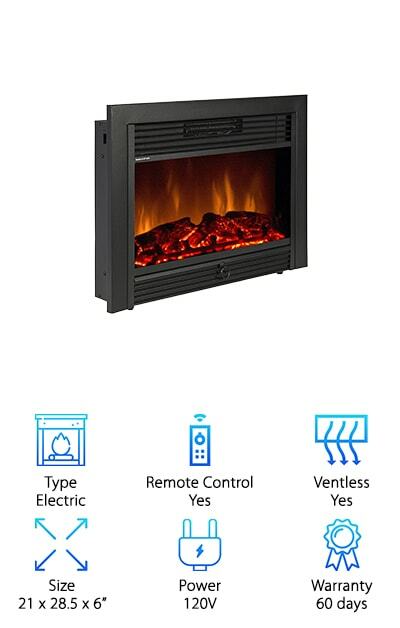 When it comes to the best electric fireplace insert reviews, the Puraflame leads the pack with a large following of raving fans. Classic and versatile, you can’t go wrong with its energy saving LED technology and one year warranty. 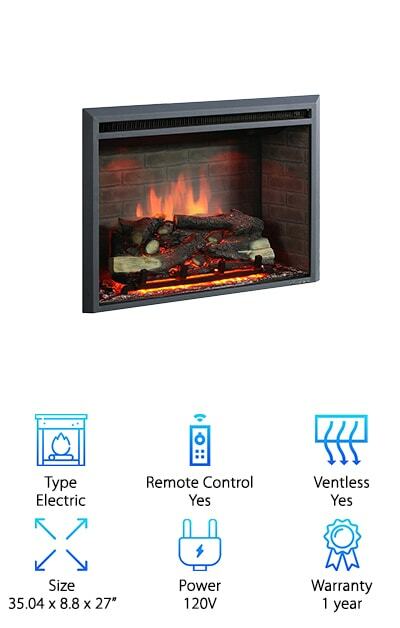 If you’re seeking the best rated electric fireplace insert at an affordable price, then you’re in the right place! Our budget pick, Best Choice, is an electric model with rave reviews and an astoundingly cheap price tag. This sleek, black fireplace features a classic look, including burning ember logs and dancing orange flames. The streamlined design compliments any room and brings warmth both physically and aesthetically to your space. Take advantage of the convenient remote control, which allows you to power the insert on and off, alter the dimness, and adjust the thermostat. A safety device is installed in this unit so that in the event of overheating, it powers down on its own. The best part? No tricky assembly required. The Best Choice comes ready for installation! Build a beautiful mantle around it or fill the perfect cabinet with this beautiful, affordable insert and enjoy the warmth of an authentic-looking hearth. 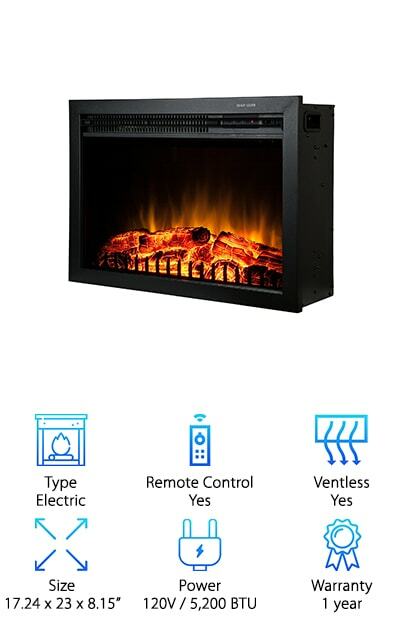 Enjoy the quality and convenience of a remote-controlled electric fireplace insert that slides right into your existing fireplace or works as the perfect addition to a beautiful cabinet or mock mantle. Heat the room at the touch of a button and don’t worry about smoke or soot, when you make AKDY your choice. Created to mimic the classic look of a real fire, simulated flames, logs, and a brick backdrop make this model an authentic improvement to any room. With 22 heating levels, it’s easy to find the perfect temperature in any setting. And the best part is, you can control it all from the comfort of your favorite seat, thanks to the complimentary remote control. Feel secure, thanks to a built-in auto shut-off feature that prevents overheating and enjoy the one year warranty that covers you in case anything goes wrong! With all bases covered, that leaves you in the perfect position to sit back and relax by the fire! Enjoy the beauty of a realistic fire with the Golden Vantage electric stove. This freestanding model looks great as an insert into a mantle or cabinet. Authentic looking logs and embers glow red, yellow, and orange in a faux grate, as LED flames dance in the background. Make your fire bright or dim, depending on the mood of the hour. Even better, control all the settings, including different temperatures, via the convenient remote control. With an output of 5,200 BTUs, you can keep a good-sized area nice and toasty. It’s the perfect compliment to any living room, bedroom, or season room and looks stunning, while in operation. Enjoy this fire year-round, by turning off the heat in the warmer months and enjoying only the ambiance. Complete with a one-year warranty and available at an affordable price, Golden Vantage takes your living space to new levels and won’t break the bank. Enjoy the ambiance of a fire year round, thanks to the ClassicFlame insert! This beautiful, brick-style model mimics the visuals of a real fire with an authentic-looking log set and pulsating, glowing ember bed. Even better, you can enjoy the option of zone heating your home, thanks to the 4,400 BTU heater and blower fan that make spaces toasty and comfortable in colder months. And get this: when it starts to warm up outside, you don’t have to give up the relaxing effect of a fire. The ClassicFlame offers the option to turn the heat off and simply enjoy the view of a glowing fire. Control five different brightness settings from your seat, thanks to the convenient remote control. A wall-mounted thermostat allows you to control how hot the fire gets and will automatically shut the heater off when the room reaches your desired temperature! And the sleep timer function sets and automatic shutdown time, so you can fall asleep to a rolling fire. Enjoy the serenity of a classic log-flame fire, when you turn on the Giantex! Thanks to this model’s convenient electric design, you don’t even have to get up from your favorite seat to start the fire. A convenient remote control allows you to power the Giantex on and off and switch between heat settings, so you can set the ideal temperature for your room. Enjoy five brightness levels that let you set the mood for any occasion. Don’t worry about the mess or danger of a real fire. All you need to do is sit back and bask in the view-- and warmth-- thanks to this model’s ability to heat spaces up to 400 square feet efficiently. Speaking of efficiency, the Giantex is designed to be energy efficient and it doesn’t release any harmful emissions. It also features a safety device for automatic shut-off in the event of overheating. The best part? The Giantex comes completely assembled, so all you need to do is install! Revive your fireplace with the Stove Builder wood insert, ideal for heating up to 2,100 square feet of living space! We combed through wood fireplace insert reviews to bring you this beautiful, classic design. Its 2.4 cubic-foot firebox puts out 75,000 BTUs per hour and burns for up to eight hours at a time. Equipped with a standard blower, you’ll feel warm and toasty in no time and enjoy the added benefit of seeing and hearing an authentic, crackling wood fire. Burn real wood logs up to 20 inches each, providing serene ambiance and all the sights, sounds, and smells that accompany flaming kindling. Cut down drastically on your heating bill, as your fireplace provides warmth throughout your home. If it’s time to jazz up your living area with a new look, and you appreciate a classic or rustic feel, then Stove Builder is the best wood fireplace insert for your chilly home! Beauty and ambiance combine to create the comforting and stylish Ashley Furniture insert. Ideal for use under television stands, you can create a lavish entertainment area sure to impress your guests and appease your own eyes when you’re hanging out at home. 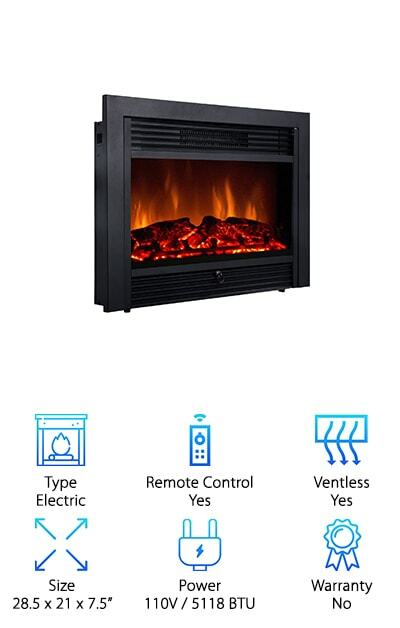 A favorite among fireplace insert reviews, Ashley lets you enjoy all the benefits of a crackling fireplace, without the maintenance or added cleanup due to smoke, soot, and ash. 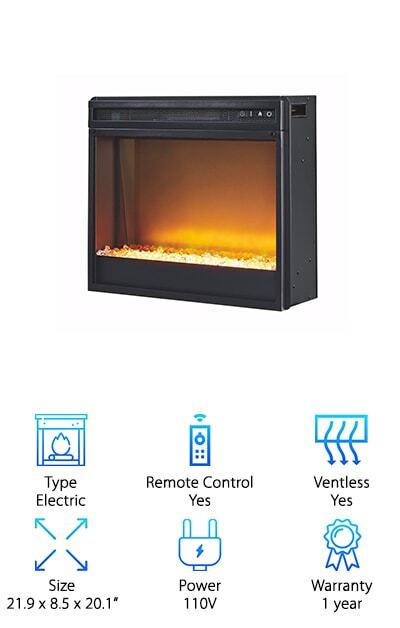 This electric model can be operated with or without heat and features two different temperatures, so you can adjust the atmosphere to your liking. While in use as a heater, you can enjoy up to 400 square feet of warmth, making it perfect for a smaller room or as an addition to your heating system. The LED display boasts five levels of brightness, which can be completely controlled with a remote control. Relax from the comfort of your couch and decide what type of fire you’d like to display! Escape into a world of relaxation with the Ignis insert. Offering an authentic atmosphere, thanks to its real burning fire, the Ignis is a sleek, thin, stainless steel design that slides into an existing set-up to bring it to life. The bottom fills with 1.5 liters of ethanol and provides five hours of continuous burning. Perfect as an insert into a mantle, chiminea, or fire pit, this stylish model gives off 6,000 BTUs of heat and requires little to no maintenance. Apart from refilling the ethanol, the most you will ever have to do is wipe it down with a damp cloth. You can thank the clean-burning, ventless design for that! No soot, no ash, no smoke-- just several hours of warmth. The simple and clean free-standing design make this insert gorgeous on its own or a wonderful starting point for lavish displays. We researched gas fireplace insert ratings and came up with the dazzling Napoleon Grandville. Boasting some of the best gas fireplace insert reviews, the Napoleon is a favorite among gas fireplace enthusiasts, and it’s easy to see why. 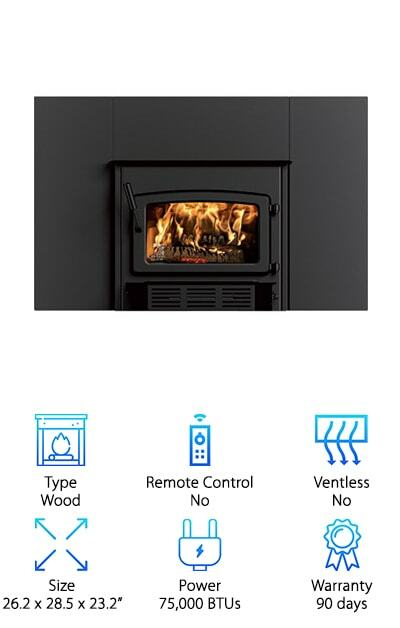 This ventless, clean-burning model runs on natural gas with a millivolt ignition and emits 30,000 BTUs of heat, so you can enjoy a warm and toasty living space. 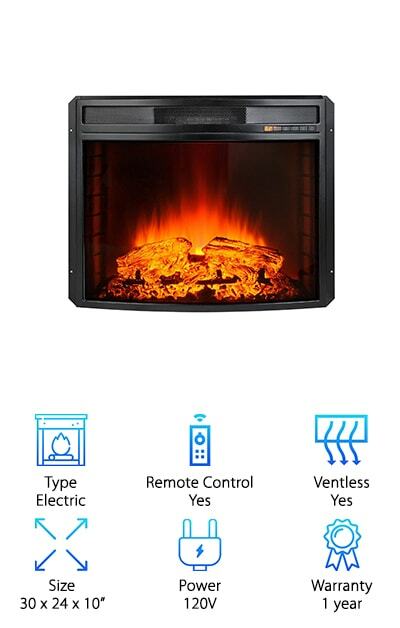 The fireplace turns on and off with the touch of a button and comes with a convenient remote control. An oxygen depletion sensor shuts the pilot off for safety, so the oxygen never drops below a safe level. 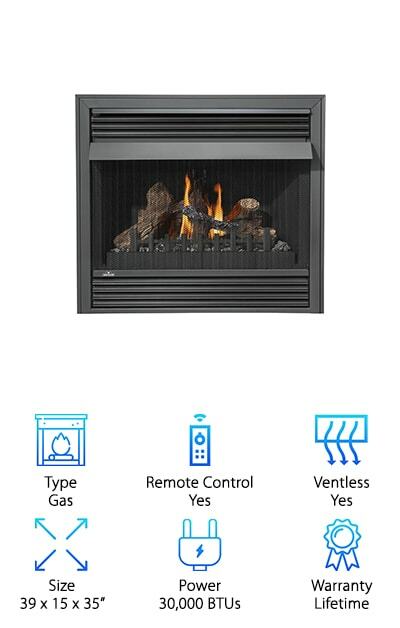 With all the benefits of a real fire, but none of the mess or hazards, this gas fireplace delivers the ultimate in luxury and comfort. Realistic phazer logs give a natural look and generate the feel of an authentic, wood-burning fire. If you’re in the market for a gas model that comes with all the bells and whistles and looks like the real deal, then look no further.